Today social networks are well integrated in our daily live and accessible with ease. They provide a range of functionality which is used in business as well as private surroundings. Motivated by this situation and the existence of improvidently users, social networks provide more and more private and business information. One aspect by the growing number of users could be the possibility to scale the level of anonymity, and related to this a fiction of privacy provided by the social networks. Id est internet users can act with there real name and write a blog about there experiences and opinions, but on the other hand they are able to act with a minimum relation to them-self. In the surrounding of social networks this user behaviour tends, on the good side, to a freedom of expression and a profit on opinion formation, like Twitter and other social networks presented in news.2 But on the objectionable side of anonymity users can easier be discriminated or cyber-bullyed by anonymous others. Largely unknown, however, is that even anonymous users, in some cases, can be identified in the web. This possibility to identify a person by it’s profile can be conflict with it’s interests. Basically if the user does not want to be identified, e.g. if she/he wants to act anonymous in a self-regulating community forum or other social networks in the web. Thereby users decision to act anonymous is not given any more if they publicize profile pictures within meta data and pattern noise. 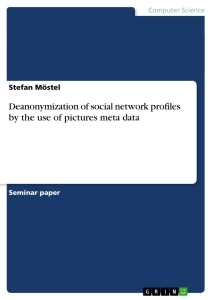 By comparing of this meta data with multiple social network user profiles the believed anonymity of a user can be fiction. To get a deeper understanding in the techniques of deanonymization, the following chapters show two ways of information generation which are not recognized by an average user. Therewith users don’t recognize the magnitude of published information. Further on I will focus on pictures presented in an user profile and available for others. EXIF EXIF meta information are stored in the first 64KB of an image. The EXIF standard8 includes a variety of possible information that can be stored in this sector of the image. Figure 2.1 shows a number of embeddable information. As examples figure 2.2 shows EXIF information of a HP® Photosmart R720 digital camera and figure 2.3 shows EXIF information of an IPhone. As we can see from the picture shown, basic information about the image (size, exposure time and date) and the device (manufacturer and model) can be concluded from meta data. In the sense of data privacy some of these information are individual-related data. The GPS9 -tag in figure 2.3, for example, indicates the position where the image was made. If the pool of image data is bigger then one picture, it will be possible to convey geographical points. By the combination of all available information of a social network profile - name, profession, company and so on -, geographical information can be related to specific activities, events or simply locations, or at least to identify or classify other pictures available in the web and social networks. This available information, witch is accessible with ease by professional photo ed- itors, can be adapted and supplemented. Therewith customized EXIF-tags can be added to include individual information like copyrights or names of persons shown on the picture. However, concluded by the level of adaptability meta data can as well be basically copied from one picture and added to an other, to hide the original information or to add meta data later on. An other methodology to identify social network profiles by the use of pictures in- formation are given by the unique pattern noise that is part of every digital cameras image. The overall picture noise is represented by a sum of different noise types that are by itself depending on different physical attributes. The main noise components are pattern noise, temperature-dependent noise and random physical impacts. Pattern noise The pattern noise represents the most important component for de- sanonymization. This camera sensor noise is statistically detectable and is assumed to be normally distributed. It is mainly composed from dark current and pixel to pixel inhomogeneities (PRNU10 ). The reason for this is the sensors production pro- cess. During the production of a digital camera sensor small manufacturing errors occur and result in slightly differences in the sensors optical property. As figure 2.4 illustrates, lateral overflow of sensor material represents one way PRNU is generated. The resulting errors are not related to the production method of camera sensors as such, more to the fact that every production process is subject of specific tolerances and conditions. Temperature noise In contrast to the described pattern noise, noise generated by the temperature is coming into existence by non-uniform temperature zones on the camera sensor (s. figure 2.4). Like figure 2.5 of an Olympus camera shows, cameras body is connected to the sensor and consequently thermal energy is transmitted from the body to the sensor. This effect is aided by the body material and its thermal conductivity, specially if the camera is carried in hand rather then placed on a tripod, or placed in sun. Another difference between pattern noise and temperature noise is the fact that temperature noise is a dynamical component of the overall noise represented in an image. Therewith can be concluded that temperature fluctuations has a negative impact on pattern noise. Other physical impacts As mentioned at the beginning of the chapter, more like the two presented noise types exist. Depending on the physical environment the camera is exposed, the proportion of different noise pattern vary. Dirt or scratches are pos- sible influences in this context, which as well lead in characteristic noises. Social Media Marketing: Welchen Nutzen haben soziale Netzwerke für Unternehmen? How will Generation Y’s Skill in Network Marketing impact ‘Purchase Social Responsibility’ in the Automobile Sector in India?